The University’s financial foundation brought in more revenue than colleges nationally did on average. In fiscal year 2016, colleges across the country posted the lowest return on investments since the recession, according to a report from the National Association of College and University Business Officers. GW’s investments had a rate of return of 1.2 percent, outpacing the average, but worse than the previous year, when the University’s investments grew by just under 3 percent. 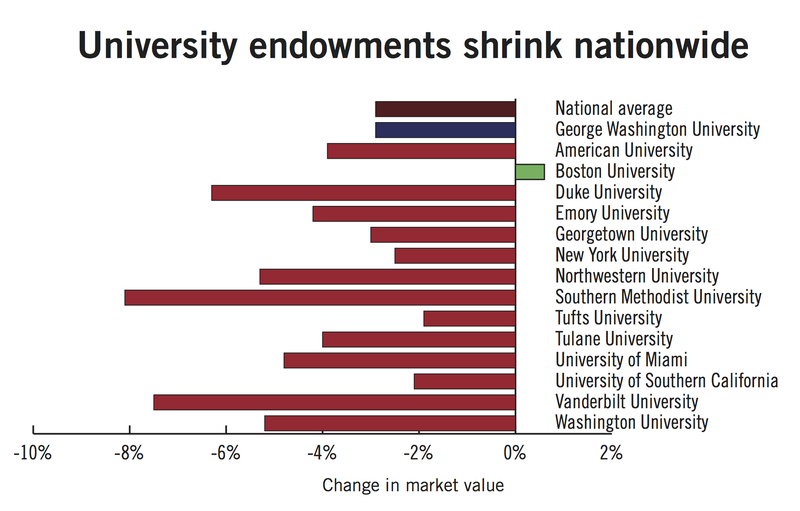 In NACUBO’s annual survey of 805 colleges and universities, endowments averaged a 1.9 percent decrease in returns on investments in the fiscal year that ended in June. GW’s endowment is the financial foundation that funds professorships, scholarships, construction projects and other University activities. The endowment invests in stocks, bonds, real estate and other financial assets. It currently totals $1.57 billion, down from $1.6 billion at the end of fiscal year 2015, a 2.9 decrease in total value. Antoinette McCorvey, the deputy executive vice president and treasurer, said in an email that the decrease in value was a combination of multiple factors. About 5 percent of the endowment pays for University activities, but McCorvey said the difference was partially made up by the investment returns and gifts given during the year, leading to only a 2.9 percent decline in total value. McCorvey said that the 1.2 percent growth in investment returns was better than most of GW’s peer institutions, and that over the past five years, returns have seen an average of 6.4 percent growth per year. Experts say returns overall have continued to suffer since the recession because of financial markets’ uncertainty. Returns from institutions across the country, including GW, were substantially less than the 7.4 percent return on investment the report recommends for endowments to stay healthy. The average return on investments for endowments valuing more than $1 billion was -1.9 percent. Over the past five years, GW’s endowment paid out a total of $357.1 million – an average of $71.42 million per year – to fund things like scholarships, construction projects, salaries and daily operations. McCorvey said the annual payout of the endowment is intended to be about 5 percent of the average value of the endowment. College affordability experts have recommended that universities spend at least 5 percent of their endowments on financial aid every year. The University’s endowment report for fiscal year 2016 states that the endowment paid out $77 million during the year, which is about 4.9 percent of the endowment’s total assets at the beginning of last fiscal year. Anthony Yezer, a professor of economics, said because the value of the endowment has been decreasing, the University’s payout rate is not sustainable unless the endowment return rises to at least 5 percent, especially as the University works to service its growing debts without raising tuition. “GWU cannot fund its borrowing from the endowment payout, it will need to fund more of its debt service from tuition and fees,” Yezer said. Ken Redd, the director of research and policy analysis at NACUBO, said that although investment returns are down, spending universities’ spending is higher than it was last year. Seventy-four percent of the universities in the study increased their spending from last year and the median increase was 8.1 percent, according to the report. GW’s endowment spending increased from $73.7 million in fiscal year 2015 to $77 million in 2016, a 4.48 percent increase. Redd said that institutions like GW that have large endowments “radically” increased endowment spending this year to continue funding research, financial aid and other university operations. “The good news for students and faculty is that institutions are still very much committed to using their endowments to fund very important financial aid and research operations and those kinds of activities,” Redd said. “The bad news is that if it continues, at some point institutions would have to make adjustments in their spending or do some other more dramatic things. Charlie Eaton, a postdoctoral scholar at Stanford’s Graduate School of Education, said total endowment value loss and low investment growth at GW and other wealthy universities could indicate that endowment managers are putting money into traditionally riskier investments, like hedge funds. The University lost $13 million in investments last year, but experts said diversifying the University’s investment portfolio into things like hedge funds and owning real estate can help minimize losses when financial markets perform poorly. The University is the second largest real estate owner in D.C. behind the federal government. GW outsourced managing the endowment in 2014 to Strategic Investment Group based in Arlington, Va. The firm has historically declined to provide information about the University’s investments, but Eaton said that a combination of paying for this endowment management and high-risk investments likely cut into the University’s returns. “They probably paid some significant fees to the outside portfolio managers that cut into the overall amount of returns that the University received,” Eaton said.